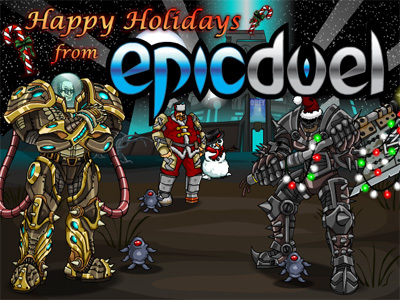 Happy Holidays from the EpicDuel Team! It's that time of year again. A time for giving. A time for caring. A time for giving thanks. I would like to take this opportunity on behalf of all the EpicDuel crew to thank all of our players for their support! This support comes in many forms. Whether you bought Varium each update or still rock all credit-only gear, dominated the leaderboards or just played a few rounds while your boss wasn't looking, we're eternally grateful for your support. YOU keep the EpicDuel community alive. You ARE the EpicDuel community. You contributed, great or small, towards the 80 million + battles fought since we started this quaint little PvP Flash game. I would also like to thank our Mods. You guys helped us keep the game safe from the beginning, and over the past year we have worked hard to add more features to your Ban Hammers. You have all truly earned your green names! Last year we had just integrated with Artix Entertainment. We hadn't even released Founder status yet! A year before that, EpicDuel wasn't even public. In fact, we conducted a small private test around Christmas time for our closest friends. Wow! We've come a long way since then. I believe this image depicts Titan as ADMIN BOT trying to convince players that he was an AI program. I think some were actually convinced! We had just finished color custom appearance, a whopping 20 weapons, and, oh yeah, Massacre could be used on the first turn. You want to talk about balance? LoL! Titan and I have been working on EpicDuel for over three years now, but this past year with Artix Entertainment has been, for lack of a better word, EPIC! When I was compiling a list of features, I kept going back and thinking, "We did that THIS YEAR? Bwah?" Here are just some of the features we've introduced over the last year! Remember, we never would have been so productive if not for your awesome support and suggestions keeping the EpicDuel community alive and growing! We've already got a huge list of new features planned for next year! Stay tuned for further updates! The best is yet to come! Tomorrow, be sure to wish your opponents a Happy Holiday...right before you bazooka them in the face! A true EpicDuel Holiday Greeting! This Friday, prepare for one of the biggest EpicDuel events yet! 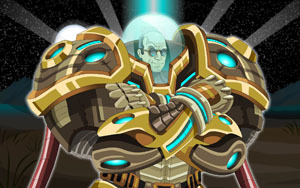 George Lowe is descending upon Delta V to challenge its best warriors and increase his collection of fallen souls. Also, to increase his collection of tiny ceramic kittens. Hey, it's a hobby. Join us for this amazing event bursting at the seams with new content! Battle George Lowe: Space Warrior! George Lowe feeds on fear...and it's dinner time! Meet him in the newly constructed Legion Arena (located just inside Fortune City), and try taking on the fearsome mercenary in his sweet space armor! Think you've got what it takes? You'd better bring your fighting pants because George Lowe fights dirty! George Lowe is also a registered mercenary for hire. For a price, he will launch a devastating (and hilarious) attack on the opposing alignment! The classes are evolving. For the first time in a loooooong time, we are introducing three new skills! Will you try them all? Assimilation: Maintaining a steady flow of energy is essential for a Tech Mage to power his or her powerful spells. In time of great distress, powerful Tech Mages can strike an opponent and drain their energy, converting a portion of it for their own. Fully leveled Assimilation can drain up to 10 energy points from an enemy while addition 5 points to your own energy reserve. Shadow Arts: A truly skilled Bounty Hunter's reflexes are so finely honed, that time appears to slow, making incoming attacks easier to avoid. This skill passively increases block rate, deflection rate, and stun rate by 1% per level of investment. Blood Shield: Using intense concentration and a portion of their own life-force, Mercenaries can now bestow protection from energy attacks on themselves or an ally. Blood Shield levels the same way as Hybrid Armor, except it eventually dissipates after 4 turns. 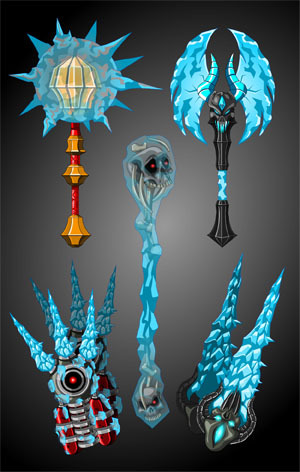 While you're visiting George Lowe be sure to browse his inventory of devastating, class-specific frost gear. If you ask nicely, he just might let you have some...for a price! The holidays are nearly upon us, and to celebrate, last week we reintroduced Frostbane. This week, we will be reintroducing the rest of our holiday rares, plus some brand new level 32 weapons for those players who have evolved a bit since last year. The devastating, legendary sword Frostbane is returning to EpicDuel and it's better than ever! Immediately after the release goes live, those who purchase the 10,000 varium package will receive the coveted blade for a limited time! New weapons have joined the party! Deck the halls with explosive alien penguins and packages of doom! Homeowners rejoice! Get into the season with a plethora of seasonal house items! Credit Option for Item Enhancements! Non-Varium users, we have heard your pleas! Thanks to new breakthroughs in item enhancement technology, all items can now be enhanced with Varium OR credits! Yes, you can also enhance partially with Varium and credits in any order. Be advised, the new technology used to enhance weapons without Varium is costly! 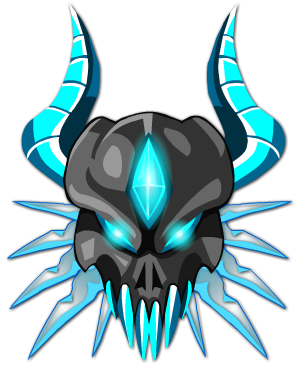 The mightiest warriors of the season may receive the Frost Warrior achievement, worth a mighty 2500 rating points! A year ago at this time, Titan and I were in the underground lab working on the merger with Artix Entertainment, and it's been a wild ride ever since! Without them, the game you see today would not have been possible, so to celebrate, we're offering a "Year of the Dragon" achievement for purchasing ANY varium package after the update goes live. This achievement will be available for a limited time to commemorate the anniversary, so grab it while you can! New level 32 weapons available from Marauder Hulk, Nightwraith, and Titan! Holiday rares return from last year! Credit option for all item enhancements! Consolidated War event log groups attacks by user and type! Frost Warrior achievement for 2500 rating points!